You have reached Chapter 5 of The Junior Entrepreneur Programme! This exciting stage incorporates Roles and Responsibilities and it is the stage wherein your pupils will be placed into teams, in order to make the project work. In this Chapter children will learn about the key roles within business teams and how co-operation is key to success. Chapter 5 presents an opportunity for pupils to identify their individual skills and talents in order to be assigned to the most appropriate business team and they will also learn that teamwork and co-operation is essential in order for the project to be a success. The teams include the Design and Production Team, the Sales team, the Finance team, the Marketing team and the Storytelling team. Marketing, Design and Production, Sales and Public Relations and Storytelling and encourage them to brainstorm what they think each area of business would involve. Working effectively as part of a team is really important in any project environment. Team players are able to negotiate with others, problem solve with their team, listen and share ideas and responsibilities. ‘My Treasure Trove of Talents’, Activity Sheet 5, allows pupils to identify their top skills or talents and you as the teacher can refer to these sheets when assigning pupils to the various project teams. It’s important to remember that group dynamics are a consideration here and the teacher is often best placed to know which pupils will work best together and in some cases those who would not. 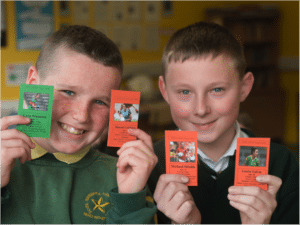 Once the pupils have been assigned to a team, there are some team building exercises on pages 38 and 39 of the Teacher’s Guide to strengthen relationships within the groups and to allow the children to get to know one another better. Don’t forget to update the ‘Class Progress’ section of your JEP online account, we love to see Junior Entrepreneurs at work!